On Friday, April 19th Virginia experienced 11 tornadoes–including one in Northern Virginia’s Reston area! Many of us were at home when this all occurred. We were inundated with news coverage and tornado alerts from the National Weather Service, but what actually do these weather alerts mean? 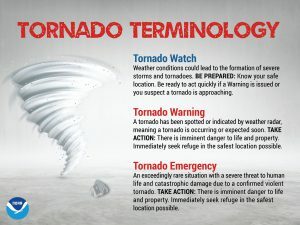 When these weather alerts are issued, it is important to know the definitions because they should trigger different actions you take. You may need to plan ahead and take precautions, or you may even need to take immediate life-saving action. 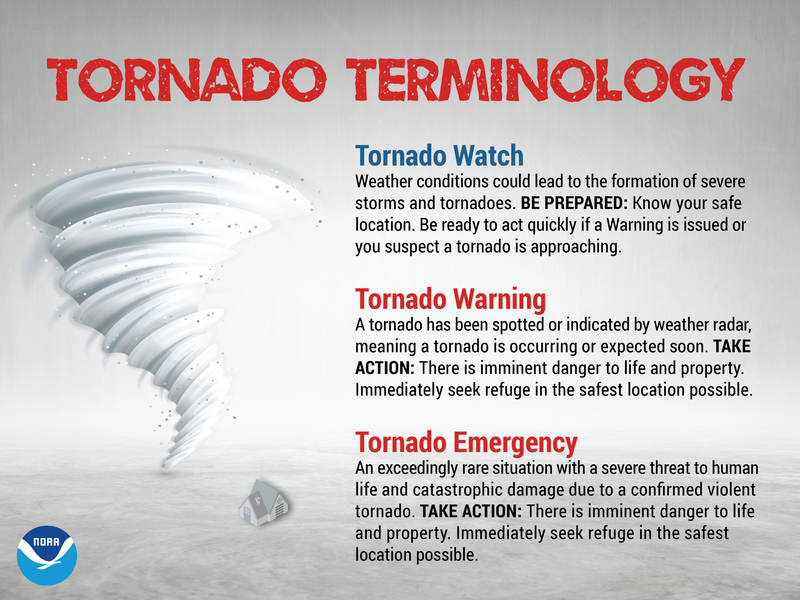 The infographic above highlights the differences between a tornado watch and warning. Please take a moment to review these definitions so you are better prepared. People 40 years ago once had an average of 17 minutes to escape a burning home after the activation of a smoke alarm. Today, that time has dropped to 3 minutes or less due to materials used in furnishings, homes incorporating more open layouts, and lightweight construction materials—all contributing to fires spreading much quicker. One thing you can do to protect yourself is to close your bedroom door before you fall asleep. The important 5-minute video below demonstrates how a closed bedroom door can potentially save your life during a house fire. In the Underwriters Laboratories (UL) Firefighter Safety Research Institute (FSRI) video above, their research reveals closed bedroom doors dramatically decrease heat and CO levels versus open doors during house fires, providing trapped occupants more time to react and escape if they can do so safely. When a fire ignites, there’s no time to act. If you would like to learn more about closing your bedroom door at night, please visit https://closeyourdoor.org/. The National Weather Service’s latest update early this morning (247 AM Tue Feb 19) places the surrounding NOVA Community under a Winter Storm Warning in effect from 1 AM to 7 PM tomorrow (Wednesday). What does this forecast say? one tenth of an inch expected. WHEN…From 1 AM to 7 PM EST Wednesday. What precautionary/preparedness actions should be taken? Make sure you are signed up for NOVA Alert and monitor the College’s website for details on our operational status. steps, sidewalks, and driveways. Expect icy and slippery conditions that may increase your risk of a fall and injury. A Winter Storm Warning means significant amounts of snow, sleet and ice will make travel very hazardous or impossible. Exercise caution if you travel. In this month’s NOVA Public Safety Newsletter, it described how one fast-acting NOVA employee was able to apply the Heimlich Maneuver to a fellow colleague in need. This is an important reminder to refresh yourself on how to perform this life-saving maneuver. Here’s a quick one-minute refresher on how to perform the Heimlich Maneuver from the Mayo Clinic. You can also find more specific step-by-step details on the Mayo Clinic’s A step-by-step guide explaining what to do in a choking emergency website. 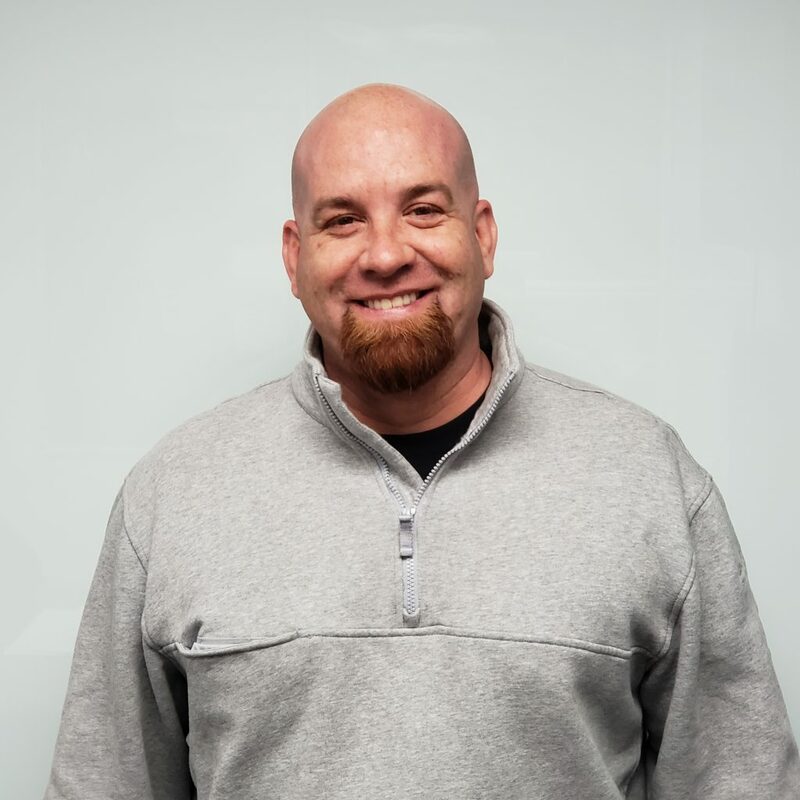 NOVA would like to welcome its new College Safety Manager, David Cook. David will be responsible for developing and implementing programs to ensure compliance with safety regulations and to preserve health and safety on all NOVA campuses. He was previously a Safety Manager for a large nationwide commercial and residential construction firm. Prior to that he was a Public Assistance Coordinator for the Federal Emergency Management Agency (FEMA), and a United States Marine. He can be reached at dcook@nvcc.edu.